Looking for Phd students, young researchers working already in the field, and Msc grades! Join the coastal summer school 2019! 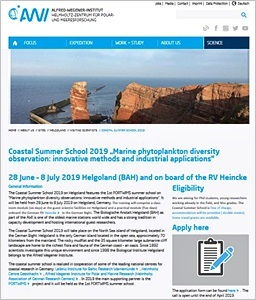 The annual coastal summer school is realized in cooperation of some of the leading national centres for coastal research in Germany: Leibniz Institute for Baltic Research Warnemünde, Helmholtz Centre Geesthacht, Alfred Wegener Institute for Polar and Marine Research. In 2019 the main supporting partner is the PORTWIMS project and it will be held as the 1st PORTWIMS summer school.